Out of my million ideas I made this card inspired by the Princess and the frog Disney movie. First I looked through my Lawn Fawn stash and stamped a bunch of images from Screen Time, Toadally awesome, Wild for you and Critter concert. I coloured them with Copic markers and used the coordinating dies to cut them out. To set the night scene I created first an inked background on Bristol Smooth cardstock. I masked off the bottom portion and started with the sky: Black Soot, Blueprint sketch, Wilted Violet and Picked Raspberry. Then I removed the mask and placed it over the sky partition. I used Salty Ocean and Blueprint Sketch and spritzed it with Tsukineko Shimmer Spritz for a subtle sparkle. I also cut the Bayou backdrop from dark grey cardstock and inked the leaves with Black Sooth distress ink to give it a dark shading. I adhered the backdrop over the inked piece and arranged the images. Then I stamped a sentiment from Winter skies with black ink. I used one of the tiny dies from the Screen time set to cut a small rectangle and wrote “Tiana’s” on it with a black thin line marker. I added a frame with a gold gel pen. As embellishment I used some star confetti from Trinity stamps and coloured the trumpet and the crown of the frog with a gold gel pen. I also covered the princess’s dress and crown and dragonflies with a clear shimmer pen. I love how this card turned out and the sentiment matches the movie perfectly too. Wouldn’t any Disney loving little girl be happy with a card like this? I hope you like my card and will pop in again soon for more inspiration. It is such a beautiful and sunny day here in Budapest, matching the card I made the other day for the Lawnfawnatics Challenge #47: What is the weather? I started with ink blending a piece of Bristol Smooth cardstock with Distress inks: Picked Raspberry, Spiced Marmalade, Mustard Seed, Twisted Citron, Peacock Feathers, Salty Ocean and Wilted Violet. I applied them at a diagonal using a mini ink blending tool. I am always amazed how well these inks blend on Bristol Smooth cardstock! Like butter! When I was happy with the result, I added water sprinkles and dabbed it off with a paper towel after like 20 seconds. I let it dry completely and ran it through the die cutting machine with the Stitched Cloud Backdrop die. Then I stamped an coloured some critters from the Upon a star stamp set using Copic markers. I used the coordinating dies to cut them out. While I was at die cutting, I also cut a bunch of clouds and a sun from white cardstock and also from Gold Glitter cardstock with the dies from the Spring Showers set, and layered them tiny offset to get the illusion of the sunshine on the clouds too. I also die cut grass from green cardstock using a Simple Grassy Hillsides die and sponged a bit of Forest Moss ink on the top for shading. After assembling the card, I stamped a sentiment from the Hello Sunshine stamp set with black ink directly on the sky and added little flower sequins I have recently got from my crafty best friend. I used a black glaze pen on the eyes and noses and added a dot to the middle of the flowers with a white gel pen. 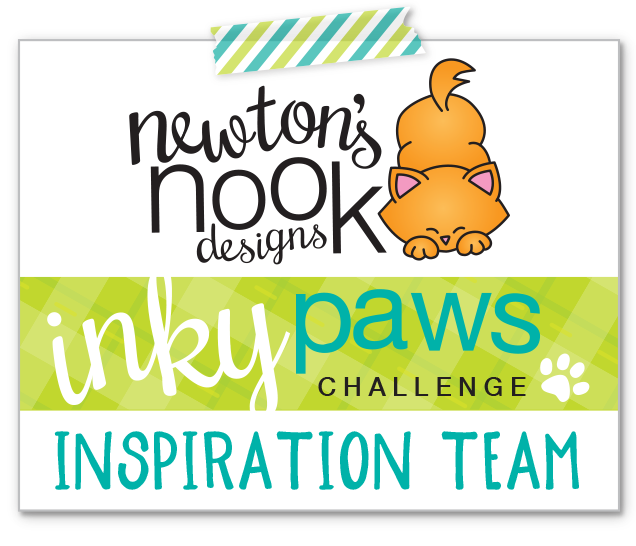 I will upload this project to the Lawnfawnatics #47 challenge and also to the Simon Says Stamp Wednesday Challenge Anything goehttps://www.simonsaysstampblog.com/wednesdaychallenge/s. 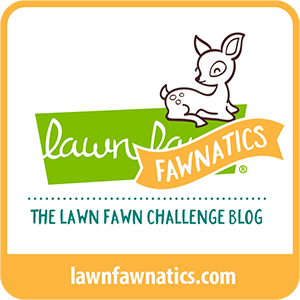 I am back today with a cute koala card i made for the current Lawn Fawnatics Challenge Happy Little Critters. I have recently got my latest Lawn Fawn order from Simon Says Stamp and i had to use the new goodies right away. So i stamped the Koala and a few eucalyptus branches from the I Love You(calyptus) stamp set on Copic friendly white cardstock. Then i used the mirror stamping technique to stamp another koala facing the first one. As the stamping was not perfect, after colouring i used a Copic Multiliner to make the outlines sharp black. After fussy cutting the images i used my Memento Tuxedo Black marker on the edges to correct any imperfections. I added Ranger black Enamel accent on the eyes and noses and set them aside to dry. Meanwhile i die cut 2 stitched scalloped rectangle frames (one white and one kraft) and layered them on top of each other a tiny offset. I also die cut some grass from Lawn Fawn Cilantro cardstock with the Grassy Hillside borders. The last elements to cut were the Candy hearts: the Hugs one from Guava cardstock and a plain one from Pixie Dust Sparkle cardstock. I assembled the scene on a piece of pink striped paper from the Really Rainbow paper pad. I popped up the koalas and the heart they are holding with 3D foam squares. I embellished the scene with a few Studio Katia Cupid’s Kiss Crystals. 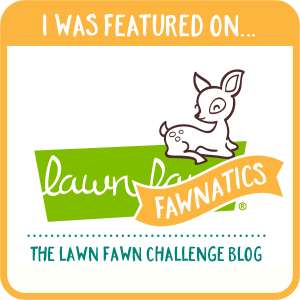 I will upload this project to the Lawnfawnatics Challenge #44. I hope you enjoyed my inspiration for today and will pop in again soon! I am back today with a project I made using some gorgeous Lawn Fawn goodies. I just simply adore their style, so no holiday is complete without some Lawn Fawn crafting! I made a card with 2 coordinating tags as I love to match the tags I use on a present with the card I give. I started with stamping the little critters from the Say what? Christmas critters, coloured them with Copics and die cut them with the coordinating dies. I also added some trees from the Winter skies stamp set as they match perfectly. Then I die cut a Peekaboo backdrop frame 2 times from white cardstock and layered them together. I cut some stitched hillside borders (using the negative part of the die cut I got slopes without stitching) from white glitter cardstock and also a few pine leaves with a great die set from Newton’s Nook Designs (Pines and holly). When I assembled the card, I placed a blue gingham patterned paper in the background and stamped the sentiments on it with black ink. As a finishing touch I used some clear shimmer pen, a black glaze pen on the eyes and glossy accents to emphasize some details. I also added a few jewels from Lucy’s Little Things to the trees as ornaments. For the tags I used the new Say what? Gift tags dies and finished them with white chunky twine from Doodlebug. I will link this project to the Lawnfawnatics Challenge #42 Winter holidays and also to Simon Says Stamp Wednesday Challenge Christmas and Monday Challenge Warm winter wishes. I hope you like my project today and will pop in again soon!